This graduate of the Berklee School of Music in Boston has been "one to watch" in the Phoenix area since taking up residence here in 1990. While there, he won the Berklee Performer/Songwriter Award four times as well as becoming a two time all around winner of the Berklee Songwriter Competition. He continues to delight audiences with his growing repertoire of original compositions, presented in performance alongside straight-ahead and Latin jazz standards. 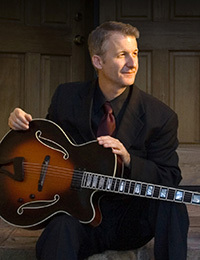 This jazz musician has four albums to his credit and plays jazz standards for corporate events, private parties, and weddings.